Advanced Digital Stepper Drive EM806 80V 8,2A (2phase) | DamenCNC B.V.
EM806 is a drive which can take 24-80 VDC input voltage, and output 0.5 - 8.2 A current. It is capable of driving Stepper Motors NEMA 23 and NEMA34. 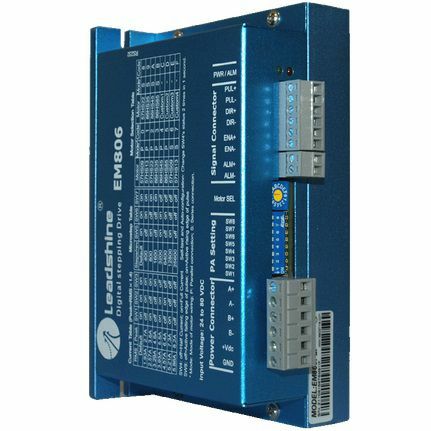 Without an external sensor such as an encoder, the EM806 stepper drive can automatically identify 100% of stall of driven motors at 300 RPM or above, and send fault signals back to motion controller or other devices The EM806 stepper drive also adopts advanced features like electrical damping, anti-resonance, start-up smoothing, multi-stepping... Its Multi-Stepping feature allows a low resolution step input to produce a much higher microstep output for smoother & quiet motor movement, and much lower motor heating. This will significantly improve the performance of your stepper control systems.